After some time off and a little relaxation the Cottage Cooking Club is working together again for a 6 month revival. For those of you that might need a refresher, we are a group of international blogger's bound together by our love of fresh seasonal dishes. Collectively, we cook and prepare dishes from Hugh Fearnley-Whittingstall's cookbooks. This time around it is the, "River Cottage Every Day" and River Cottage "Love Your Leftovers". Andrea our fearless leader and host of the The Kitchen Lioness is once again guiding us through. However this time around there is a twist, for our new adventure we are preparing any and as many recipes that we want from either cookbook. This month I chose 4 recipes, all from the Love your leftovers cookbook. I’ll start with breakfast first. Eggs….well to start they are versatile and the perfect conduits’ for leftovers. Because of our mild winters we are able to buy fresh tomatoes, asparagus and most veggies that everyone else can buy during the summer months. Anyway; this dish is composed of a sorely forgotten and wrinkled tomato, goat cheese and fresh parsley. Simple and delicious. (page 43). Next, the open topped sandwich. Now “toast” is the perfect vehicle for leftovers. And it’s great for appetizers and/or any meal of the day. Here we had arugula, brie and prosciutto, but any veggie, meat or cheese would work. (page 41). Potted smoked fish was an easy favorite. In this dish I used leftover hot smoked salmon, parsley, dill, olive oil and fresh lemon juice. Another amazing combination, great on toast, and delicious with pasta. (page 108). Chicken soup, what can I say, a classic. Here I used rotisserie chicken, couscous, celery, leeks and carrots. The broth was the star here as it was made beforehand and simmered about three hours. Always a winner, chicken for dinner. These recipes have been adapted from the "Love Your Leftovers” by Hugh Fearnley-Whittingstall. To see what recipes the other members chose for this month, head over to the LYL post for February 2017 on the CCC website, by clicking here. Lol, yes we should have. It all looks great, love the eggs and the smoked fish. Have a great week! Thanks Pam, it is great to be cooking with our little group again. Your food looks good. Thanks for stopping by. A friend named the room for me. How did you come to find my little corner of the world? Going to look about your place now. Happy Eating! Glad you came by, found your site from Moveable Feast, Barbara. Thanks. Thanks. I don't know the blog, offhand. But it's always interesting to me to see where folks come from. Thanks. I need to have a look at this book! Sounds like a good one. Love the idea of pairing potted smoked salmon with pasta! That was my favorite Lisa, love anything with salmon. Thanks! Each dish looks like a winner Cheri. Love the smoked potted fish - on toast ... yes please! Love salad, great eggs - all terrific! Thanks Lisa, it's fun to be cooking together with the CCC again. Everything looks so good but the smoked potted gets a star from me. Oops, I mean the smoked potted fish gets a star from me. Cheri, I'm chuckling as when I went to look at my emails now I saw your header "Cottage Cooking Club" I saw Andreas email last month, purchased the book, but then it didn't arrive until the day before the posting day. And then I didn't see any posts come through from anyone with CCC... so I thought... oh well, maybe it was changed! Happy to see your selections and everything looks lovely! Hi Peggy, wow! you moved pretty fast to get a post together, loved your choice, been eyeballing that bread myself. I so want to try that potted smoked fish. And your soup looks really tasty as well. Thanks Tandy, the potted fish was my favorite. I am liking this other book at CCC! Your four dishes for February looking enticing! So am I Emily, you really went to town with your dishes. This will be a fun 6 months. I love using leftovers. It is always fun to see what comes out of them! That soup looked great! Thanks Abbe, we consume alot of leftovers especially now that we are only cooking for 2. Thanks Kim, that was very kind. Everything looks fantastic. Especially, the omelette and the open faced sandwich. 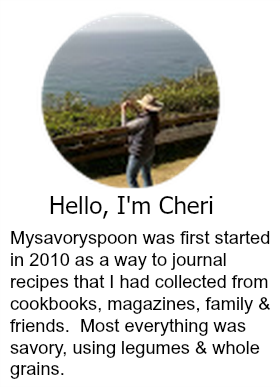 Lovely share, Cheri. Thanks Anu, it is fun working together as a group. Everything looks so delicious and healthy too, I love esp. the smoked fish. All the dishes look awesome! We've all been fighting a cold on and a bowl of chicken soup sounds so good right now. Hope you all feel better soon Kelly! I really need to look at those books -- I've liked every recipe you've made from them. And these are no exception -- really great looking (and tasting, I'll bet!) stuff. Thanks. Thanks John, it's fun to be cooking together as a group again. Oh Cheri...everything looks so good...I need to take a look at these books...thanks for the post! Thanks Juliana, they are wonderful cookbooks, both of them. Thanks Karen, I happen to have alot of cookbooks as well. My husband and I keep talking about downsizing, will have a hard time getting rid of mine. Everything you shared it something I would love! Thanks Susan, now that it is the 2 of us we have many leftovers to contend with. Great choices! I really like Love Your Leftovers. It really inspires me not to let anything go to waste and it's a great guide for when I'm feeling uninspired about the contents of my refrigerator. I am trying to not waste food, but the more that I've focused on the subject the more I realize how much we actually waste. Nice to get together again. These all sound so good, I wouldn't be able to choose which to make first! Thanks Caroline, they are all so simple but delicious. I love what you've done with leftovers here -- the dishes look just delicious! Thanks Marcie, hope you are having a great week. All 4 of your dishes sound fabulous!! Thanks Liz, hope you have a great week-end. Some great ideas here, Cheri. The soup looks marvelous! Thanks Barbara, Hugh makes leftovers much more glamorous. Interesting to use couscous in your chicken soup. These are some lovely recipes! Thanks Amy, couscous gave this soup and wonderful texture. Dear Cheri, thank you for participating in The Cottage Cooking Club again. You certainly made some lovely recipes from Hugh´s book - my favorite one would be the Potted Smoked Fish - I like the idea behind this dish and how you served it - very nice! But, of course, all the other dishes all look fabulous, prepared, as always, with lots of love and attention to detail! Thank you again for being part of our online cooking group! I am looking forward to the March posting! Thanks Andrea, my favorite was the potted fish as well and of course his meal on a toast recipes. My husband and I probably have some combination on toast at least a few times a month. Take care! The Potts smoked fish sounds particularly good, Cheri! Glad you are all back to doing this! Darned autocorrect! That was "potted," as you probably figured! Lol! I agree that darn autocorrect. Yes I am glad too, this time it is for 6 months, last time I believe it was for 2 years. Enjoy cooking with this group. 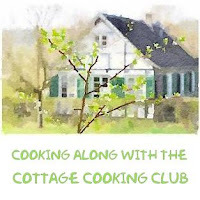 Thanks Dena, the CCC is a wonderful cooking group. Everything looks wonderful, but I could really go for a bowl of that soup right now! I love all these dishes and I've really come to appreciate and love leftovers, too! As usual, it's great to see how you try different things for new inspiration. Four recipes--that's ambitious! They look great--I am a real open faced sandwich lover too!